We are a group of riders and horse owners that understand the importance of proper fitting riding equipment. We recognized a need in the equestrian market for a product that would make riding comfortable for both riders and their horses. We founded Success Equestrian to meet that need and deliver a high-quality, no-slip saddle pad at an accessible price point for our fellow riders and horse lovers. Beyond our core team is a group of experts in the equestrian world, from trainers to world-renowned riders. They help guide our saddle pad developments through extensive testing and evaluation, to ensure we are delivering to you the best no-slip saddle pad available on the market. Our goal is simple: to provide the best products and service to our customers at the lowest prices possible. We take great pride in our company, our commitment to customer service and in the products we sell. Our online store is designed to provide you with a safe and secure environment to browse our product catalog. Start exploring and let us know what you think! We value your feedback, and welcome your contribution to help guide the evolution of our no-slip saddle pad designs. Have any questions about the product? Don’t hesitate to contact us here, or give us a call at 215-794-7004. Along with our online store, you can find our Success Equestrian no-slip saddle pads at your nearest tack shop location. Browse by zip code or nearest location to find the tack shop near you. We value our tack shop clients for their continued support and partnership in carrying our range of no-slip saddle pads and products. Are you a tack shop and want to know how to carry our products? Send us your inquiry here, or give us a call at 215-794-7004. I’m excited to be working with Success Equestrian. They make great quality products that really work. After schooling I never have to dismount to adjust the tack anymore. I can just enter the ring. This pad doesn’t move! – Liza Towell Boyd, Professional Hunter Rider and Trainer. Hear what our customers and partners have to say! We value your input and feedback from experience using our no-slip saddle pads and products. We would love to hear from you. Please feel free to share your pictures and experiences with us. If you don’t have a photo your comments will mean just as much. If you send a photograph taken by a professional please be sure you have written permission to use it on our web site. Don’t forget to send along the photo credit so we can be sure to give credit where credit is due. It is our understanding, here at Success Equestrian, that all photographs shown on this page meet these requirements. Send your photos and comments to info@successequestrian.com. This is a great quality saddle pad; attractive enough for the show ring yet durable enough for daily use. In addition it eliminates the need for non-slip pieces of rubber. These pads are excellent value for the dollar. Success Equestrian saddle pads are the perfect combination of style and function. They look fantastic in the hunter and jumper rings, and the gripping action keeps the saddle right where it's supposed to be. 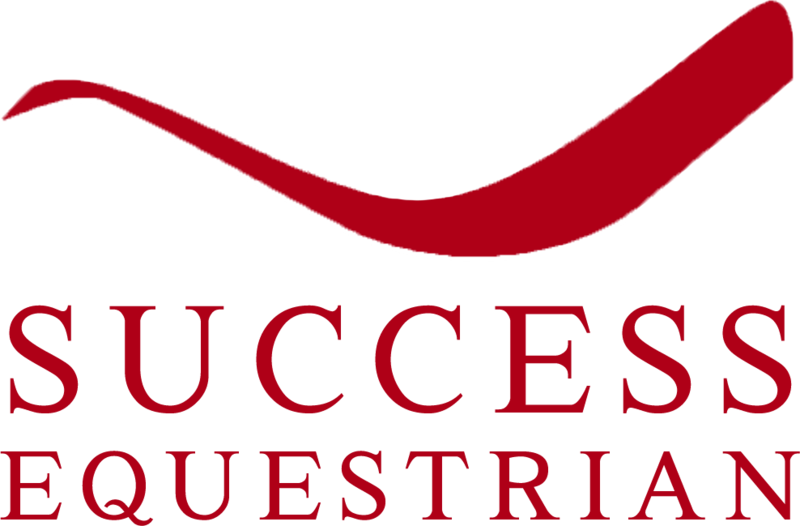 I’m excited to be working with Success Equestrian. They make great quality products that really work. After schooling I never have to dismount to adjust the tack anymore. I can just enter the ring. This pad doesn’t move! Once we discovered the new Success Equestrian Hunter No-Slip Saddle Pad we no longer need to use layers of rubber squares under and on top of our fleece Saddle pads. The fit is perfect for all of our Equitation and Hunter's saddles. Thank you Success Equestrian for making No-Slip Fleece pads for our show-rings! This is the only brand of saddle pad I ride in because they really stabilize the saddle and there is no lateral slipping. Because of this, the pads help the rider maintain a better balance so you can be more effective. And the horses like it too. As a Para Dressage rider who has had a major stroke that affects my entire left side, I often struggle with both my saddle pad slipping under my saddle, as well as my saddle slipping off to my strong right side. Once I tried my Success Equestrian Deluxe Dressage Saddle pad this worry became a thing of the past! My saddle and saddle pad are right where they should be from the beginning of my ride to the very end. I feel better and more secure as a rider, and I know my horse’s are happier and more comfortable too. Thank you Success Equestrian for making such a great saddle pad! We love the new Success Equestrian saddle pads. It fits well, washes great, and I like the feeling of the foam core. The foam adds stability to the pad. It stays more centered and opposes any shifting that a thinner/flimsier pad allows. It's similar to riding with a 'sheepskin' half pad -shock absorbing but not bounce-like. A dense soft feeling - it's nice! In the early fall I was very fortunate to win a new Success non-slip pad via eventingnation.com. My horse has always had an awkward style of saddle fitting and these pads only have increased my awareness of the importance in the steadiness of my ride. The pad was one less worry for me at a recent Combined Training event in Aiken (pictured here) and helped us finish on our dressage score and new personal best of 29.0 and in 2nd place. I now own one for all three phases of eventing. Thank you Success!!! I LOVE your pad!! As a para equestrian I must have a pad that will not slip especially while mounting and dismounting and your pad never moves! It is such a nice feeling to know that my saddle is secure and that my horse is able to move comfortably, this allows us to train productively and compete confidently! I simply can't praise this pad enough! I highly recommend it to everyone! Kudos on the excellent design and fit of the saddle pad. I can't tell you how many pads I've tried over the years on the 6 horses I've had the privilege of riding, and this one has the best fit and feel of all of them! And perhaps most importantly, as promised, it does stand up to washing. I love your product. My VERY WIDE Dutch Warmblood has been a saddle challenge and you fixed it! LOVE the pad. Fit my saddle absolutely perfectly and even though my horse was dripping with sweat my saddle didn't move an inch. Thanks so much!! My other show pads are going in the trunk for extra equipment. I have been struggling for years with the saddle sliding forward on one of my horses. Your pad has helped to keep it reliably in place and now I can attend clinics and shows without worrying that the saddle will end up on her withers during the first extended trot! These pads are awesome! I love that you don't have to crank your girth so tight and the contoured top line gives my horse more room to jump. I feel a big difference and so does my horse. Thank you Success Equestrian! As an upper level event rider, I sit on top of a horse for more hours during the day than not. It is a struggled to find a saddle pad that stays in place and does not rub my horses back while also being affordable enough that I can use them both at home and at the show. When I came across the Success Equestrian saddle pads, I knew I had found a product that fulfilled all of these requirements. For the first time this winter I made it through with out any rubs on my horses backs! And the best part is both the jump and dressage pads are very stylish so I did not have to sacrifice turnout for comfort.